… From pacing it out, I would guess it to be 110 feet long and 70 feet wide, a space filled with twenty-two rows of weathered wooden pews, conventionally cut with aisles down the center and at the margins. The brick walls are regularly broken by wooden panels, which run floor to ceiling and encase a terraced array of Plexiglas boxes colored in pastels of pink, lavender, and lemon. Roughly thirty-five feet up, a lowered ceiling implies a function as much acoustic as aesthetic. …. Centered at the front of the dais, a raised square is flanked with a haphazard array of amplifiers, and potted plants. In the wood veneer cradling the altar from behind, a knowing eye can detect how a rotary stage used to accommodate a week’s succession of sacraments – although, for security reasons, it’s been a decade since it last turned. (10-11). “Airy” this chapel may be, but it is also clearly well-worn, showing signs of its age and past uses, and its ongoing utility born of federal and state mandates to provide space for observant prisoners to practice religion. 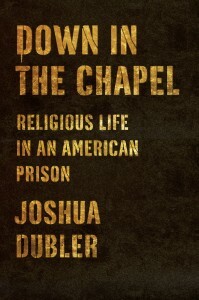 Given the multiplicity of identities of American inmates, the chapel itself brings into “fecund coexistence” America’s “many ways of religious life.” Dubler’s book, an ethnographic portrait of one week in the life of this chapel and the ongoing conversations among prisoners, chaplains, guards, and volunteers, is a closely hewn study of the kinds of religious practice that take place therein. Dubler’s chronicle details precisely how the circumstances of prison life alter the experience of time (infinite for those who are “lifers,” yet at the same time regulated minute to minute) and space (restricted and managed by gates that open and close at particular times) and thereby the experience of prayer. Within this larger prison system, the chaplains and others must make time and space for numerous religious groups – prisoners who wish to pray, to take classes, to worship. The exigencies of a national project of mass incarceration, the context of confinement, and the proximity of unchosen neighbors that Dubler presents in this book complicate any neat portrait of multi-faith practice as a choice.